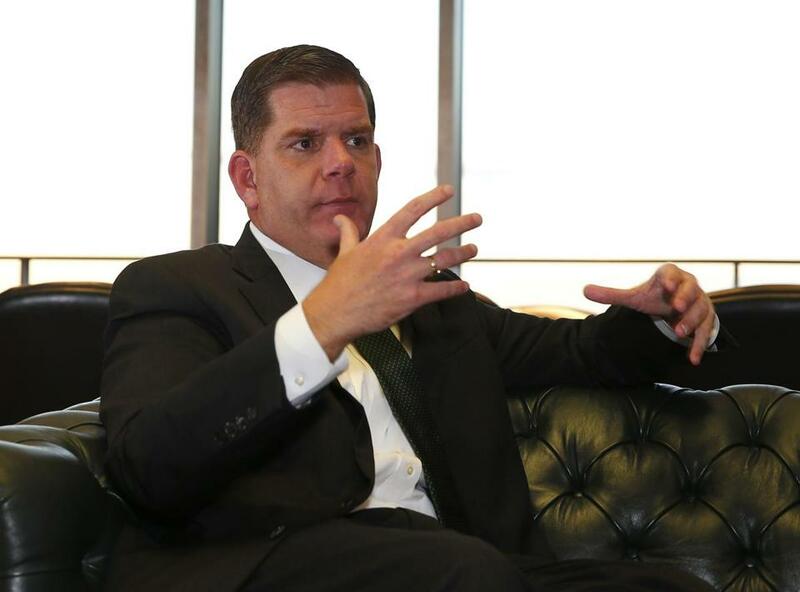 Boston Mayor Martin J. Walsh is proposing to raise the city’s goals for construction company hiring of residents, minorities, and women. Since 1979, a city ordinance has required construction companies to demonstrate good faith efforts to guarantee that 50 percent of all hours worked go to Boston residents, 25 percent to minorities, and 10 percent to women. The companies must report to the city the progress they’ve made. Walsh’s proposal, filed Monday, calls for increasing those goals so that 51 percent of hours to go to city residents, 40 percent to minorities, and 12 percent to women. The proposal would also apply the same goals to hours worked by apprentices. The goals are intended to ensure that highly desirable building trade jobs are spread around to reflect the city’s diverse demographics. “The success of Boston’s growing economy relies upon our ability to open the doors of opportunity to all our residents, and remove barriers causing economic inequity throughout our city,” Walsh said in a statement Monday. The heavy reliance on white men and on workers from outside the city has raised concerns as real estate development across Boston reaches historic highs. “We’re in the third-largest economic boom in the city’s history and it’s important that Boston residents are a part of that movement and that the construction industry reflects the demographics of Boston and its diversity,” said John Barros, the city’s chief of economic development. Construction is an industry that can offer people in disadvantaged communities a path out of poverty. Its workers in the Boston area make about $66,000 per year, or nearly $32 per hour, on average, according to data from the US Bureau of Labor Statistics. For years, the industry as a whole, and most companies individually, have failed to meet Boston’s targets for hiring residents and women. Even the city itself has failed to meet those targets on projects in which it was the developer. There has been more success in recent years in meeting the goal for hiring minorities, but progress in that area has stalled. For example, according to city officials, residents have accounted for about 29 percent of hours worked so far in 2016 and women for 5.6 percent, both well shy of the current goals. Minorities have accounted for about 31 percent of hours worked so far this year, which is above the city’s existing goal, but shy of Walsh’s proposed target. Advocates have argued that the 25 percent target for minority work hours is seriously outdated, given that, in the city’s overall population, minorities outnumber whites 53 percent to 47 percent, Census data show. The mayor’s proposal also calls for having just one city agency — the seven-member, mayoral-appointed Boston Employment Commission — handle compliance. Previously, compliance was handled by either that commission or the Boston Planning and Development Agency, formerly known as the Boston Redevelopment Authority. The proposal also would have the City Council review the work of the employment commission twice each year. The existing ordinance already allows the city to discipline noncompliant companies, including by suspending payments for any municipal funding tied to the project, removing the company from the project altogether, and banning them from future projects that involve city funding or require city approval. However, such drastic steps have rarely been taken. Noncompliance has typically resulted in a meeting where city officials urge the company to develop plans to get into compliance. Barros said the city hopes to work with construction companies and other stakeholders to gain compliance. “The city is very serious about these goals,” he said. Officials from Walsh’s office said the proposal to update the ordinance, called the Boston Residents Jobs Policy, was drafted after consultation with community advocates and stakeholders in the construction industry. “It also strengthens our fight against this region’s escalating income inequality,” Turner added in a statement provided by the mayor’s office. Local leaders in the construction industry, including union officials, have said that they have taken steps in recent years to try to promote construction careers to minorities and women, including by launching training programs. One hurdle to increasing diversity, industry officials have said, is that many of those who have started careers in construction did so because a parent or another close family member worked in the field. Walsh’s proposal will now go before the City Council for approval. If the council passes it, the changes would go into effect immediately. The city will likely proceed cautiously in updating the ordinance. Taking a stricter stance could prompt legal challenges that could jeopardize the existence of the policy. In other Massachusetts cities, including Worcester, Fall River, and Quincy, similar policies have been overturned after legal challenges within the past 15 years.